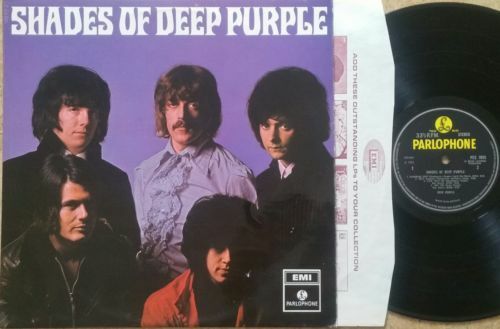 "SHADES OF DEEP PURPLE" RARE ORIGINAL 1968 UK PROG ROCK LP NICE 1ST PRESSING EX! Vinyl solid UK quality pressing. The disc is in a LAMINATED FLIP-BACK cover, complete with Custom Company advertising inner sleeve. Brilliant Ritchie Blackmore guitar combined with Jon Lord's virtuoso talent on keyboards, this was the original Purple lineup, featuring founder members Rod Evans and Nick Simper. This was not available for long in this original form before the lable style was changed, this is the FIRST issue format and a first pressing! The VINYL is WONDERFUL EX shape, FULL SHINE and a couple of fine lines only, only a few very sparse signs of sleeve removal. Beautiful top quality vinyl with FULL shine! Classic Yellow & Black 1968 Lables are in clean NEAR MINT- CONDITION. Also, no pen stickers or tears. I can't see any spindle marks at all here. The LAMINATED 'FLIP-BACK' CARD COVER grades NEAR MINT, a super example ! This has lovely as-pressed shine, very light wear only. The original Parlophone album advertising inner is included, bright and clean with no wear evident. The disc will be sent in another plain sleeve to preserve this. It is a supefb copy of this original issue! Bid responsibly, knowing all item details. See my other auctions, there's no extra postage for multiple purchases.